Maserati gives the first glimpse of the external look of the Levante, the first SUV in the Brand’s more than one hundred years of history: the new model completes the existing range of sedans and sports cars, extending the offering together with the Quattroporte, Ghibli, GranTurismo and GranCabrio models. 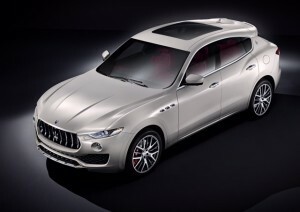 The Levante’s design features clear associations with the Maserati brand and its absolutely Italian character: the aggressive front includes new, tapered headlights separated into two units, with the upper headlight unit connected to the radiator grille. Maserati’s design signature is clearly visible on the sides: the three iconic air vents on the front fender, the trapezoidal C-pillar with the “Saetta” logo and the large, frameless door windows. The rear is dominated by the very slanted back window and a streamlined shape, both typical of a high-performance sports car. At the technical level, the Levante’s chassis is designed to combine the outstanding on-road performance typical of every Maserati with unrivalled handling even on very low-grip surfaces and an excellent off-road performance and ride. One very impressive strong point of the new Maserati SUV relates to the standard contents supplied on all versions: sophisticated electronic suspensions with controlled damping and air springs which can be set on several levels, “Q4” intelligent all-wheel drive and 8-speed automatic transmission specially calibrated for the Brand’s new SUV. When it comes to propulsion units, the Levante is equipped with petrol and diesel engines that are all Euro6-compliant. The Maserati Levante is built at the Mirafiori plant in Turin; the first cars have already come off the assembly line and the market launch is planned for this spring in Europe, to be followed by the rest of the world.